Another fun source of scarecrow ideas is current affairs and politics. What is the theme of the latest political debate in your area? Can you think of a funny way to comment on a current political issue? Saving Energy is a major theme in current affairs world wide right now. 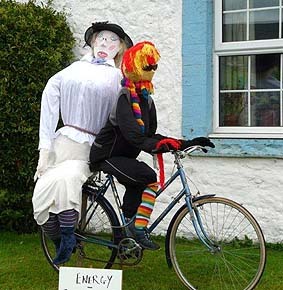 Here is a fun scarecrow display commenting on the saving energy debate. It was made by Peter &Chris Lloyd of Farlam Parish in UK. Photograph courtesy of Hugh Beesely. Note: This page includes celebrity scarecrow ideas for you and your kids to make: scare crows showing current affairs and political ideas.